Two weeks ago we tried our first taste of an Indian style Pumpkin dish when we made our Pumpkin Lentil Curry. That was a decent dish but not too exciting. I wouldn’t necessarily make it again. However, when I had it for lunch either the next day or the one after that I thought it was very good. I think all it needed was time for all the flavors to settle in and mix together. Tonight though, we were hoping for something good away. 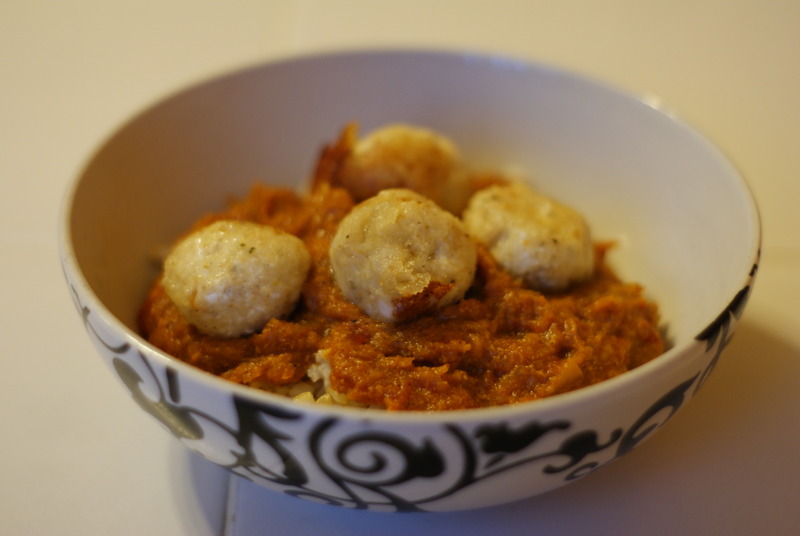 We wanted a tasty dinner and our hopes rested with Cottage Cheese Koftas in Pumpkin Gravy. The recipe comes from the same place we got the Pumpkin Lentil Curry, Lite Bite. First order of business was cutting the pumpkin. All the previous pumpkins we had processed were gone. 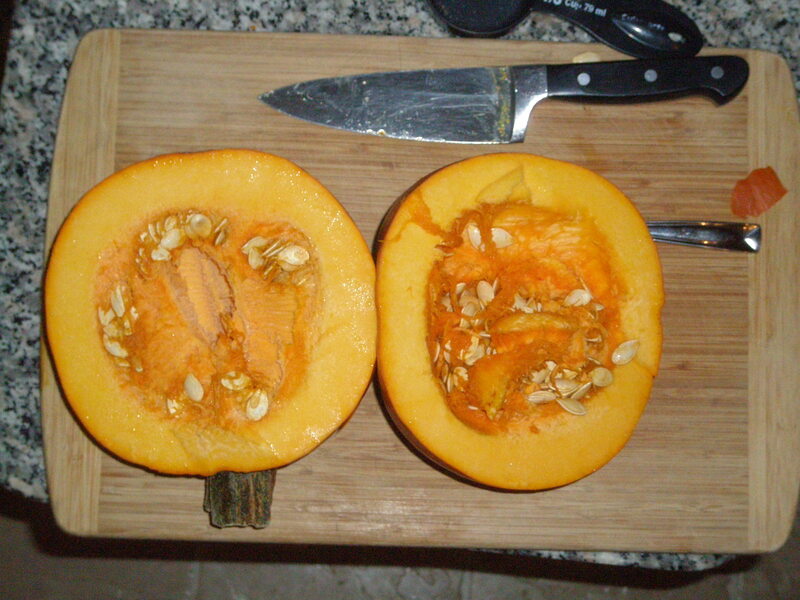 I was dreading this process because the last pumpkin I cut was as solid as oak and difficult to cut. My worrying was for nothing and I made quick work of it. I used a little less than half of the pumpkin. Next up was making the koftas. For this recipe these are balls of cottage cheese, breadcrumbs and some spices crisped to a nice golden brown in a skillet. I made the mix as suggested and put them on the heated pan. Immediately after putting them on I thought to myself, “These are mostly cottage cheese, what is preventing them from just being a blob of melted cheese?” AS it turns out, the answer is nothing. Nothing prevents them from becoming a blob of melted cheese. Oh but what a delicious blob of melted cheese it was. The last step was making the gravy which is just pumpkin, tomato, onion, some spices and yogurt pureed and mixed together. One of the things I love about Indian food is the bright colors. The gravy didn’t disappoint with a nice dark red-orange color. It looked good and it smelled good too. Since I had time and some cottage cheese left I decided to try again with the Koftas. This time I added a lot more bread crumbs than the recipe called for. The mix was doughier, dryer and more solid. 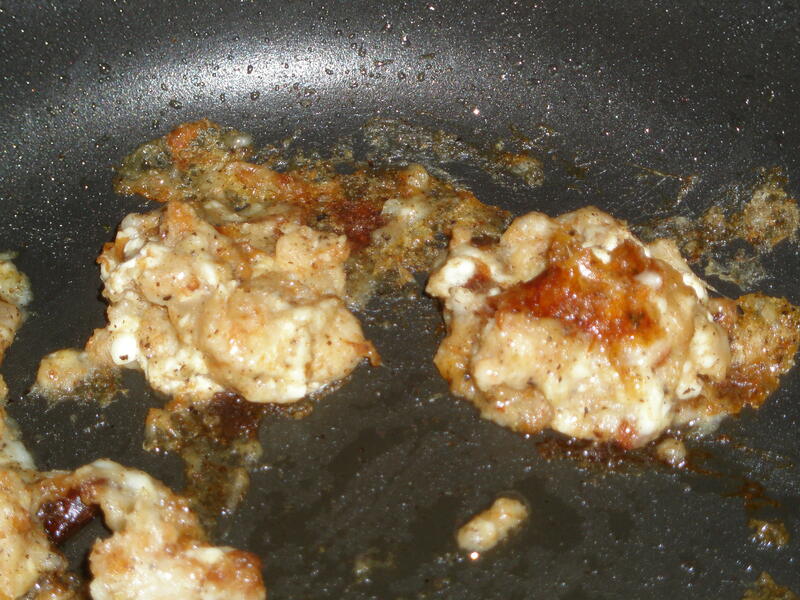 And when I put them on the skillet they didn’t turn into a blob of melted cheese. They still got melty but not as bad. Once the girls got home it was time to eat. It was good. Both Sarah and I liked it. She thought it was comparable to grilled cheese sandwiches and tomato soup, with just a little bit of spices to it. We felt it was simple, but not in a bad way. I know that sometimes people hear “Indian Food” and are worried about it being too spicy hot, or too spicy weird, and this was neither. I thought it was a good comfort food. We would definitely recommend it and have it again, and who knows, maybe once the flavors get some time to blend together it might taste even better. Method; Crumble fresh homemade Cottage cheese and the bread slices coarsely. In a large bowl add crumbled cottage cheese, bread, coriander leaves, black pepper, salt and mix well. If you are using soya granules, soak them in warm water for 10 minutes. Squeeze completely and add to the cottage cheese and make koftas. Make small balls with the above mixture. Heat 1 tbsp oil in a flat pan and shallow fry all the balls till they turn golden brown in colour. Peel and chop onion and pumpkin, dice tomatoes. Heat 1 tbsp. oil, add chopped onion, diced tomato, pumpkin cubes and sauté for 6-7 minute on medium heat. 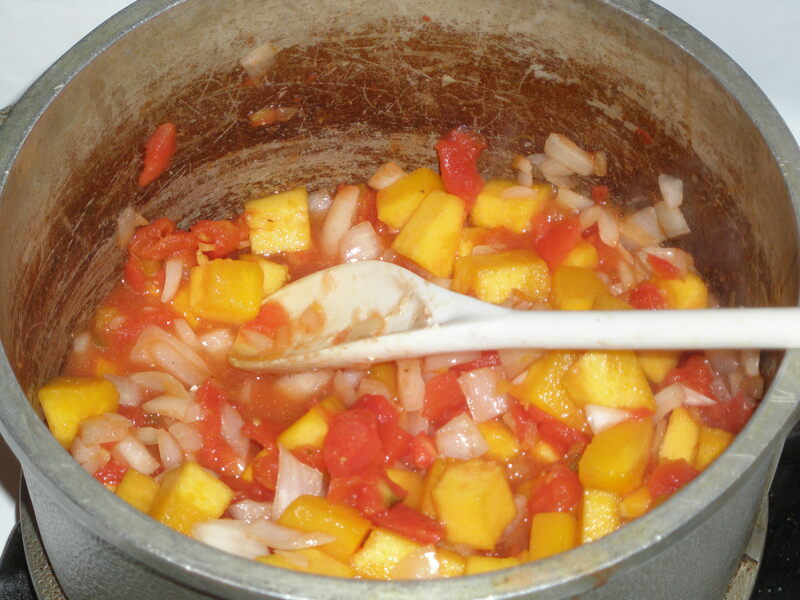 Blend sautéed onion, tomato and pumpkin into fine puree. Heat remaining oil in a wok and add cumin seeds. Pour pumpkin puree in the wok, add chili powder, coriander powder, salt and cook for 10 minutes on medium heat. Whip yogurt lightly with a fork and add it into the pumpkin gravy. Cook for another 2-3 minutes and take off the flame.